Case 1 ‧Easy construction of CR shell,The cleanness of duct between CF and CR shall be maintained.CR protocol is necessary. Case 2 ‧CR protocol is necessary for cleanness maintenance. Case 3 Production and operator is separated to assure the ultra clean environment. 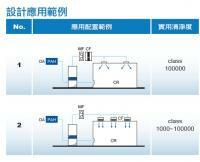 Case 4 ‧Automatic production line for maintaining ultra clean environment. Case 5 ‧Raised floor is installed to achieve ultra clean environment.Easier CR protocol. Case 6 ‧The cleanness varies from up steam to down stream. Case 7 ‧The high cleanness can be maintained for partial area.For application in turbulent clean room. Case 8 ‧Ductless system,Easy CR protocol,Easy construction. Case 9 ‧Ductless system,Raised floor can be installed to achieve ultra clean environment. Case 10 ‧Supply air duct,direct air return.Easy construction. Case 11 ‧Iso lated clean room with individual cleanness. Case 12 ‧Low class of cleanness for large area.Only maintain the ultra clean environment for production line.